What a symphony of a dram! This is Laphroaig Single Malt Whisky 10 years old, 40 % alcohol volume. The colour is amber, rich sparkling gold. The liquid moves in the glass like a swell on the sea. It looks heavy, oiled and together. It smells like rope, with an underlying whiff of warm bananas and a salty tinge. A rounded nuttiness. Below this is iodine and peatiness, an underlying taste that makes me think of dark, wet wood ~ like an old pier. 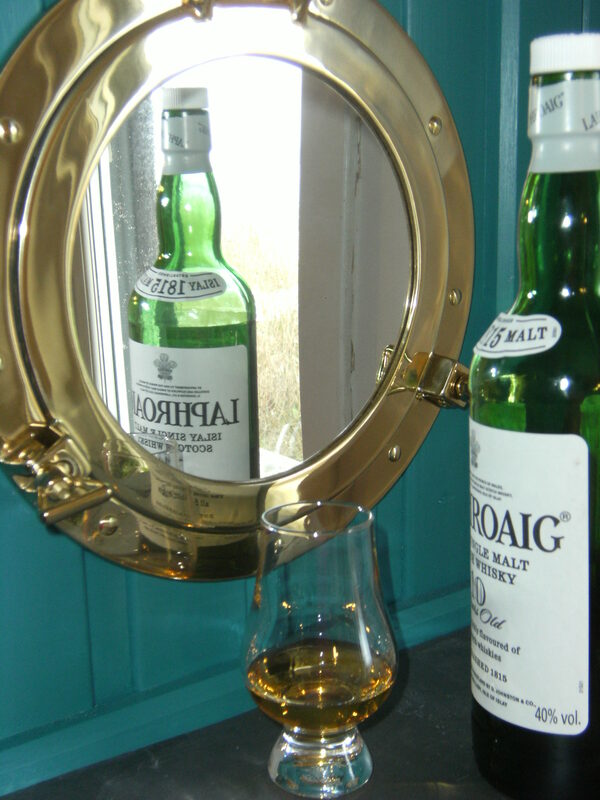 The whisky clings to the glass when you swirl it up, a shiney, naturally oily overlay coats the inside of the glass. It has strong, reasonably fast legs ~ after all it is a reasonably young, albeit well balanced 10 year old. This is a powerful, pungent whisky, but it is also light and sparkling! ~ how can this be? On the tongue it is smooth and silky. Tastes fresh and vegetabley ~ in from the left side comes the flicker of a taste of apples, with custard on top ~ a bit of vanilla from the oak of the bourbon cask. An underlayer is harder, sweet and sugary, then something round like red currants. A dark acridness. This is a deep, textured whisky with timbre. Next is the wet sheeps wool taste with something light and blue on the top. This is the iodine, medicinal, seaweed taste. A sharpness is left on the tongue and the top of your mouth. There is a lingering finish and a warmth in your heart! If you put water in, it tastes thinner, ropey and greener ~ but this is also very tasty. 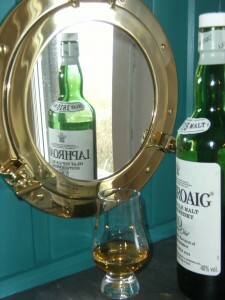 The Laphroaig 10 years old single malt is matured in 1st fill Bourbon casks. No sherry. The spirit cut at Laphroaig is 72-60.5 and the stills run very slowly. They have the longest foreshot run in the industry. The ppm of the malt is 40 – 50. And when it gets to the bottle the whisky has a 5-20ppm. Laphroaig 10 years old is a sweet, strong flavour of a dram. The sweetness comes from the small size of the stills, also the alcohol content is only 40%, which tempers the alcohol burn we perhaps are expecting from such a powerful looking and smelling dram. The sweetness also comes from the Makers Mark bourbon casks, giving the vanilla and caramel flavours. There is an earthiness and a saltiness. Because the dram is matured on Islay it tempers the sweetness and perhaps this, as well as the salt in the peat, is where the salty taste comes from. All in all, this is a bloody great dram!